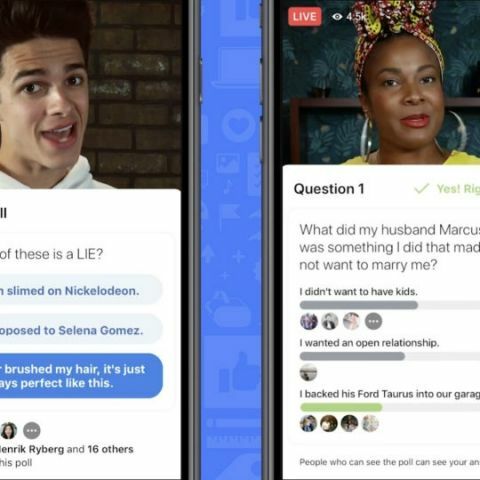 Creators will now be able to conduct polls and gamify their Live broadcasts for making them even more engaging. Facebook has also introduced new tools that help brands get in touch with creators and more. Facebook has announced some new features aimed at helping creators make their live streams more interactive. The company has started rolling out polling and on-demand video as well as gamification for Live broadcasts. These tools are said to help creators turn standard Live videos into engaging ones. The new update comes after Facebook tested showing a creator’s top fans by displaying a badge next to their names back in March. This enabled better identification and interaction between creators and users, and this feature is now being rolled out broadly. Alongside these features, Facebook is also adding more videos to its Watch service. However, this service is not currently available for Indian users. Further, Facebook announced a new Brand Collabs Manager which will help creators be discovered by brands for new branded content collaborations. It will help brands search and find creators with whom they can “potentially establish deals and partnerships.” The feature was being tested with a limited set of partners and will now be rolled out broadly. For creators who make longer videos, the social media platform is starting, in phases, the Ad Breaks program that will display mid-roll ads for increasing monetisation on such original content. This is currently being made available in the US. Creators who have shorter yet niche content or “super-fans” will be able to earn money directly from their audience via fan subscriptions or digital goods. For limited users, Facebook was testing a way for fans to support their favourite creators by pledging $4.99 (Rs 340 approx) per month. In exchange, they would get access to perks like exclusive content and a special badge that signifies their status as a supporter. This feature is now being expanded to more creators. The social media platform is also introducing a bunch of new tools that will allow creators to manage their presence on the website. A new video template is being tested that creators and publishers can use on their existing or new Facebook Page. As the name suggests, with the new template, more prominence will be given to videos on a Page and it will come with special modules for videos and groups. Additionally, the Creator App is now available for Android globally and this comes one year after the app was made available for iOS.